Studying abroad and budgeting are two words you normally do not find in the same sentence. Although it takes time, effort and dedication, it is absolutely possible to stick to a budget while abroad – I’m the proof! As a study abroad returnee from the University of Glasgow in Scotland, I dealt with (and overcame) bad exchange rates, a missed flight, ATM withdraw fees… everything that can make or break a budget. If you are preparing for your adventure of a lifetime and worried about stretching your money, read on for tips on how to maximize your budget! 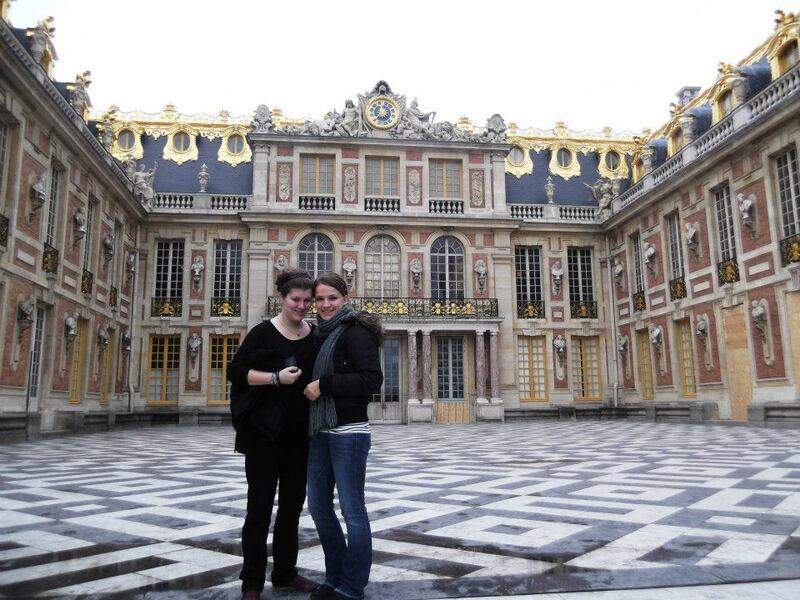 My friend Rahela and I at Versailles happy as could be… before we missed our flight back to Glasgow. 1. Sit down and figure out how much money you can afford to spend while abroad. You’d be surprised how many of my friends had virtually no idea how much money with which they started the semester. It seems basic, but if you don’t know how much money you have, how can you budget? Remember to take into consideration any expenses you will have while abroad – credit cards, car and insurance payments, etc. 2. Ask your bank if they partner with any banks in your study abroad city – or if they are willing to waive the ATM fees for you! $5 ATM fees add up quickly! If it all possible, use your bank’s “sister bank.” For me, it was Barclay’s in the UK and I got free withdrawals! Some banks are willing to waive the ATM fees entirely – it never hurts to ask! 3. Get a credit card (if you don’t already have one) – preferably a MasterCard or Capital One. Credit cards are a necessity while abroad, especially for booking tickets online. If you can, get a MasterCardã – which only charges a 1% fee for international use – or a Capital One – which doesn’t charge anything. 4. Plan your trips as far in advance as possible. Spontaneity is great… for everything but your wallet. If you book trips in advance, you will get far better deals. I booked most of my trips at least 2 weeks in advance and was able to go to London for $25 roundtrip on the bus. 5. Check the up-to-date exchange rate often. While I was in Glasgow, the rate dropped significantly, so I withdrew a lot of cash that week and had enough money for a month. The seemingly small savings in a lower exchange rate can really make a difference! 6. Check and see if your city offers student discounted rail (transportation) cards. If you plan to take the train, for example, often, it might be worthwhile to buy a rail card. In the UK, they cost about 30 pounds up front and then you get 1/3 off all fares! Great deal! 7. Take advantage of the student discounts – they are likely everywhere! 8. Re-budget often. For me, it was once a week on Sunday nights. It’s important to take a look at your finances every so often to make sure you’re still on track. I spent 15 minutes every Sunday night looking over my online banking statements and checking how much cash I was going to start the week with. 9. When something doesn’t go as planned and costs you extra money, relax. No matter how much planning and budgeting you do, it is possible that something will go wrong and cost you more money than expected. For my friends and I, when we missed our flight back from Paris, we ended up spending over $300 to rebook on the next flight. Although it was awful, we just had to be especially careful with our money for the remainder of the semester. 10. Keep everything in perspective. If you’ve been DYING to go to London since you were 10, make it happen even if it’s pricey. Some trips, items, meals are worth the splurge! Just because you’re sticking to a budget doesn’t mean you can’t be extravagant once in a while. Previous Don’t Disappoint Uncle Sam: Vote While You Are Abroad! I am heading to Glasgow in January! These tips have definitely helped, because I am freaking out! Thanks for sharing awesome tips to stay in abroad in budget. I usually spend to many and my dad always scold me so from now i will try following your ways and will share my views on it.